WebberStory Time Communication Boards teaches students with limited verbal skills to recognize and use the most important vocabulary words in 20 popular storybooks. * This versatile teaching tool allows students with language delays, autism, and other communication disorders to participate in reading activities using Mayer Johnson’s BoardmakerPicture Communication Symbols (PCS). Webber Story Time Communication Boards is ideal for the SLP, teacher, or special educator working in an inclusive setting. The complete set includes four identical communication boards for each story and 12 matching picture cards (240 cards total) to teach expressive and receptive communication skills. The lessons and activities in the workbook reinforce vocabulary and the included CD-ROM makes it easy to print activity pages in black and white or color. * Uses the following books with your Webber® Story Time Communication Boards. If you haven't been over to Communication4All lately it is worth a return visit. Bev Evans has added a plethora of new activities and printables since I last posted about the site. From board games to interactive story maker powerpoints there is so much to explore and try out. Give yourself some time, have your printer ready (or at least your bookmarking tools) and think outside the box for ways to use these materials with out students! Zoodles is joining the ranks of Zac Browser, Kid Zui and Kido'z (kid's browsers I have mentioned before) as a means for children to safely navigate the internet. Like Kid Zui, Zoodles is free for a basic plan. However if you want Ad Blocking and the Parents Dashboard (and you do, because it IS a kid's browser) you need to shell out $7.95 per month, $39.95 for 6 months and $59.95 for the entire year (Kid Zui is $3.33 a month). Kido'z is also a divided service, free for basic and $50 a year for plus. Zac Browser is free. Zoodles runs on Adobe Air. 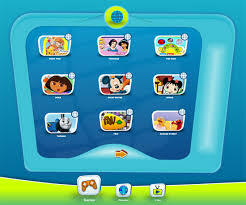 It allows access to educational website and tracks time spent in each subject area, displaying it for the parent to see. All of these kid's browser's have something to offer. Below are screen shots of Zac Browser, Kid Zui and Kido'z. SWAY is switch accessible You Tube, but by switch they mean switches (set to right and left arrow). Still, better than nothing! Basically you paste the address of a playlist into the textbox and then you can use your switches to navigate the videos. It works only in the Firefox browser. Here is SWAY set to play the TLWMSN Vlog. I have been a basically good girl this year. As I know you are busy I am writing this post in hopes of perhaps winning a dream gift from YouSayToo. My dream gift is for my classroom. As you know I reach five wonderful students ages 14-18 with multiple special needs. Over the next year there is a pretty good chance my classroom will grow to six, seven or eight students. Santa, my students are so amazing. They come into school everyday ready to try whatever I set in front of them. This is in spite of the fact that, for the most part, my students need technology for nearly everything they do. My students use wheelchairs to get from place to place. They use special (and very expensive) technology to help them communicate. They need specialized software and computers to help them learn. That is where you come in, Santa, you and YouSayToo. YouSayToo is having a $1,000 dream gift give away. I would love for my students to have a Mayer-Johnson Mobile Activity Player. 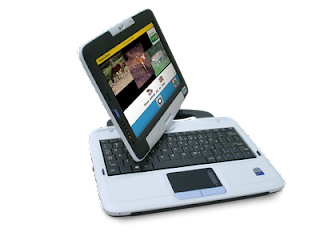 It is outrageously expensive ($949.00), but it consists of a sturdy convertible netbook/tablet computer with six Curriculum Companion Activities. The netbook/tablet would give my students a way to access specialized curriculum through the touch screen or by attaching a switch interface and switches. 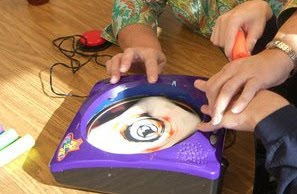 Since it is pre-installed with Boardmaker Player software it can be used as a communication device or as a learning tool. The Curriculum Companion Activities will add new ways for my students to explore learning topics in the classroom. I am sure lots of bloggers are going to enter the YouSayToo Dream Gift Give Away, Santa, but won't you put in a good work for us? If this blog wins it won't just be a prize for a blogger, it will be an opportunity to enrich the lives of teenagers with multiple disabilities. I can't think of a better reason for us to win, can you? If we can't win the dream prize, Santa, will you let them know that we could use the Photoframe Keychain constellation prize for visual schedules if we installed pictures of picture symbols or students engaged in their schedule. That would be awesome. Vocaroos is offering a free download of their simple, easy-to-use, audio e-mail software, Vocaroos Express, from now until 12/26/2009. Check it out. In an effort to record, review and share with parents a student's ability to use a high tech AAC device we recently mounted a Flip Camera to a students wheelchair. Currently we have about 45 minutes of footage which gives us an interesting perspective on this student, the device usage, the motor skills used in accessing the device and some of the linking between pages the student does with out actually "saying anything out loud" (this was surprising to us). As we set up the camera to show only the device screen and the users hands the footage catches things we miss when we think we are watching how the user is accessing the device. The footage is also great for calculating data points for alternative assessment and progress reports. If you are supporting any high tech AAC users I would highly recommend trying this out! Shiny Learning has six simple switch games from cause and effect to timing levels on their website. They can be played in your browser or downloaded. The games include Mouse Follower, Fly Swatter, Car Crusher, Press to Move, Balloon Bang and Blast the Pirate Ship. Reindeer Orchestra is a fun little activity that is great for mouse, mouse emulator, touch screen and interactive white board as well as working just fine with two switches set to tab and space bar. Free play or match the numbers and beep the red noses to make a song. Enjoy. Put everything in a big bowl. Using beaters (with switches galore) beat until well mixed. Pour into greased baking pans, follow baking directions on Cake Mix box. Optional: Half way through baking cover with foil so the "pudding" is more steamed than baked. Once upon a time there was a special needs teacher. She supported a teenager who used a communication device from Big AAC Company. The model of his device, the Quick Silver, was older, but not old enough to allow purchase of a new AAC device. Sadly for the teacher, the teenager and the speech pathologist, the Quick Silver runs software from Giant AAC Company. Giant AAC Company has grown very huge recently, with their gobbling of smaller companies and so forth. However, one of their main stay products remains the software that runs on the Quick Silver. The thing is that every time Quick Silver breaks the teacher or the speech pathologist calls Big AAC Company for support. Big AAC Company says the issue is a software issue and that they are "no longer allowed" to support Giant AAC Company's software. This is because Giant AAC Company has decided to make their software licenses unobtainable through pricing or other methods. The teacher and speech pathologist have been hearing this story of licenses from just about every AAC vendor on earth these days and they are pretty tired of it. In fact it is making them want to never, ever buy anything from Giant AAC Company again. However calls and e-mails to Giant AAC Company claim that the issue would either be fixed by paying all sorts of money to upgrade the software or that the issue is not software related at all. This is only after the teacher and speech pathologist loose hours of work with disappeared programing and the directive from Giant AAC Company to delete the preference files (a very bad idea). Giant AAC also claims that Big AAC is allowed to support their software, which is an annoying argument to be stuck in the middle of when a teenager is sitting around voiceless. Something is very wrong with the AAC industry when Big AAC Company and Giant AAC Company cannot manage to support the users they have. This is almost ironic for the teacher and the speech pathologist because Big AAC Company and Giant AAC Company are both bending over backwards right now to try to sell devices to other teenagers in the same class. Guess what? This teacher is voting for Little AAC Company or Less Well Know AAC Company until Big AAC Company and Giant AAC company redirects their focus towards meeting the needs of AAC users. Madi, the Dynavox using, powerchair driving star of "So Don't and See What Happens!" is back in Sour Puss with her brother and the family pet. 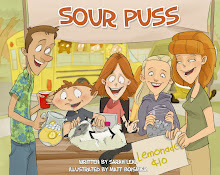 I haven't seen it yet, by my class really enjoyed Madi in her first book and I hope we end up with a copy of Sour Puss soon. Both books ate $15.00. Would you like to add to your selection of online resources? Check out this list of the 50 Best Blogs for Special Education Teachers. I am happy to have Teaching Learners with Multiple Needs on the list. Animated Christmas is a good resource with many things to explore. 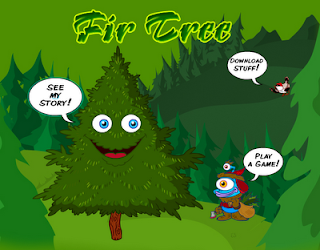 In particular your students may want to look at the interactive animated storybook, Fir Tree. Might be a nice addition to a multicultural winter celebration unit. Although my class is studying Charles Dickens this month here are some links for those of you doing unit on multicultural winter holidays, be it part of the Unique extra lesson or not. Trabasack: Lap Tray, Bag and Mount All-In-One! this is taken from Barrie at One Switch Blog. The Trabasack is a fantastic UK designed product that is a bag and lap-tray all in one. 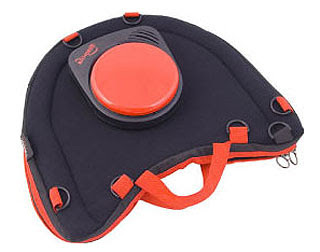 The Trabasack Curve as pictured has a Velcro surface making it ideal for many switch users when away from home. Comes also in a rectangular shape in a medium and mini size, with and without being Velcro accepting. The wheelchair version has special strap designs for wheelchair attachment. The trim comes in different colors too. Buy direct from Trabasack or the USA vendor Windsor Direct. The Splatz Switch Holder is a washable, non-slip switch holder for 2.5 inch round switches (Jelly Bean, Buddy Button) with a hole to thread the cord through. They come in the four colors shown from QED for £15. As I've mentioned we are doing a unit on A Christmas Carol. 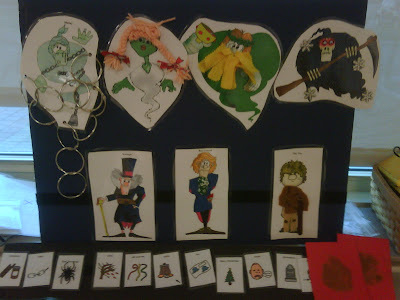 These are the characters in Pete Well's adapted sensory story version of A Christmas Carol. Our first lesson for the unit the students were shown the characters and each picked one to adapt into a multi-sensory icon, using Pete Well's suggestions and their own ideas. Today we used the multi-sensory icons as props in our first viewing/telling of A Christmas Carol. Help Kidz Learn has three new activities up. Plus they have moved their Advent Calendar back to the front of the line up for the season. The Advent Calendar is a good add-on to a morning meeting routine on a "Big Screen". All three of the new games are designed to teach waiting to press the switch until a visual/auditory cue occurs. These games are all great to teach "switch happy" users to slow down, look and listen before pressing their switch. Coconut Shy is a switch game where you wait until a ball appears to "throw" it at the coconuts atop the sticks, no need to aim. 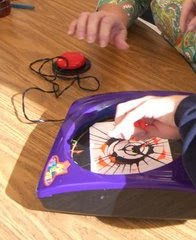 This game is create to teach students to wait to press their switch, in this case to wait for the auditory and visual cue that the ball has appeared. Gophers Down a Drain Pipe is a similar game, in that it also teaches waiting. In this case the student must wait for the Gopher to slide down the inside of the pipe and appear to whack it with a newspaper! In both Coconut Shy and Gophers the teacher can set how long until the "reveal". Mystery Egg is probably the simplest of the new games, students need only wait until the mystery egg pops onto the screen to press their switch and crack it open to revel a dancing character (in a way this one brought back some unwelcome flashbacks of "Teen Tunes" from the 1990's for me - I think my student will need to use headphone with this one!). I have 8 Google Wave Invites to give away. Comment with your e-mail address and I will send one to you. First come, first served, when they are gone they are gone. Hallmark is now offering 'Twas the Night Before Christmas, All the Ways I Love You and Bright and Beautiful in their new Recordable Storybook format. These books allow a parent, grandparent or other to record themselves reading the story and have that recording played back automatically as the pages of the book are turned. A flip of a switch "locks" the recording in even if the batteries die. A very cool idea when used in the way intended, but possibly even cooler if you start thinking about it as an AT adaptable. You could print out a social story on full page labels, stick over the pictures and record the text. You could do the same with the steps of a routine such as a life skills routine or vocational task and the book will automatically play the next step when you turn the page. Hallmark's recordable storybooks retail for $29.99. This blog entry is a work in progress, feel free to comment to contribute! For the month of December (as there is not a full Unique Curriculum Unit and I am missing creating my own units) my class will be doing a unit on "A Christmas Carol". We will be working from Pete's Sensory Story version and most of our activities will stem from that simple retelling. Here are some of the resources we will use. This sensory story version is a slide show with sound effects and simple animations which is activated by switch. Meanwhile the teacher reads from the script which comes with the slideshow while the teacher and aides expose the students to related sensory experiences, like touching a chain or smelling cinnamon. I will also have large TOBI (true object based icons) of the characters which have textures added to them for the students. Our classroom iPod will also be loaded with a couple of audio versions of the story. And a special thank you to my new friends and colleagues as well as the parents and students at my new job! I feel blessed every day to be working with such wonderful people and to have the privilege of teaching such fantastic students. As we enter the busy rush of the holiday season may we all find peace, joy and contentment. In what has to be one of the most bizarre things to happen to me yet last night I was mauled in the left hand (at the base of my thumb mostly) by this neighborhood stray cat I pet frequently. If you have never been bitten, forget mauled, by an animal let me give some news, it hurts. I drove myself, in my pjs (since I had run down to put out the trash in my pjs) to the ER with my hand wrapped in some blood soaked gauze. Treatment started with a wash of the bites (there are about eleven of them) and a hand soak in a betadine solution. Since the feline in question was both unknown to me and whereabouts unknown I was treated immediately for both possible bacterial infections and rabies. Yup, rabies. Forget what you learned on Different Strokes, the injections were not in my stomach. Ten injections of Rabies Immunoglobin were given into my backside, thighs, upper arms and into the wounds. Then the first of five rabies vaccines was given DIRECTLY INTO THE WOUNDS, that would be along my thumb joint. The vaccine is about the thickness of corn syrup and it was took multiple "sticks" to get it all into the swollen and unyielding joint area. Then I was given a tetanus shot. I also had two IV drips of anti-biotics. Nausea inducing anti-biotics. Finally I was bandaged, given the dates for my future returns to the ER for more rabies vaccinations, and told that at my third visit I will be sent to see a surgeon if I am still unable move my thumb. My good hand full of prescriptions and a note to return to work I headed home, it was about 3:30 AM. I am taking a blog hiatus to recover. I plan to return either after Thanksgiving or after my last rabies vaccine injection (12/17) when ever I feel the closest to "myself" again. I am this many! Happy Blog Birthday! 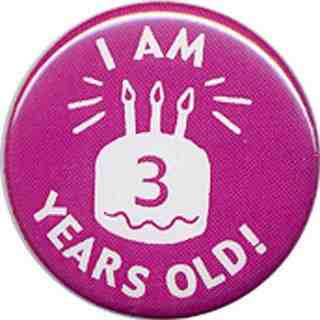 Today marks the third birthday of Teaching Learners with Multiple Special Needs! Whoo-whooo! What started out as a way for this special education teacher to give back (and keep busy during recovery from ankle surgery) has turned into something much, much bigger. Approaching 1,000 posts, 130+ Google foll0wers, an average 850-1000 visitors a day, nearly 500 Google Reader subscribers (and who knows how many other RSS readers) and about 500,000 visits total since inception. Wow! Who knew? There is also now an active TLWMSN Ning (online discussion group) and a Facebook Group. If this blog has helped you this is your time to come out of the woodwork. Please comment and leave some blog birthday wishes! 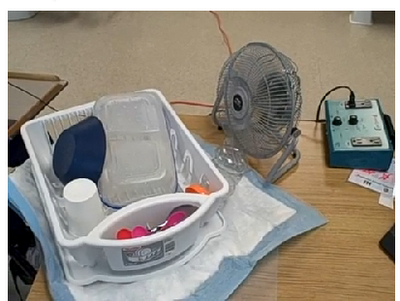 The student is accessing a wobble switch at mid-line on her wheelchair tray to activate the Wireless Jelly Bean Switch, which is plugged into the Power Link environmental control unit, which is controlling the power to the juicer. The teacher is pressing the lime onto the juicer. In the end we juiced one cup worth of lime juice! We have a morning routine that goes something like this: the students gather around the projector for morning meeting and one of my wonderful teaching assistants gathers up a behavior chart, a dry eraser maker, and a huge Time Timer. She approaches a student and reminds her of her ability to earn a reward by collecting ten stars. A star is given each time ten minutes passes on the Time Timer without incidence of interrupting/disruption and a bonus star is given for each appropriate AAC device activation. Through our morning meeting I watch the student and the staff quietly interact as they draw dry erase stars on the chart and re-set the Time Timer for ten more minutes. Ironically, almost, the reward this student earns is use of the classroom iPod touch to listen to music. She uses Flick Tunes to be able to more easily change the song, but in general is just content to have music on. Won't it be cool this week when I can download the only app I have been waiting for from the iTunes store and have this entire process move to the iPod Touch? The Time Timer App (get it in the iTunes store) is a way to have a Time Timer in your pocket. It is perfect for counting down those difficult transitions (we just used our "old fashioned" Time Timer for this the other day, a student who does not like to leave on Fridays is given a five minute countdown on the Time Timer and then leave school like a pro) on the go. We will even think about adding one of the many star charts apps (iAchieve, iRewards, Earn It Stars) to our iPod Touch as well, so the entire process from the Time Timer to the stars to the music is in one place - on one iPod. Barrie over at One Switch has shared this great add-on to make Power Point slide shows a bit more usable for our students. The add on is called 4Pete's Sake in reference to the wonderful sensory stories at Pete's Stuff. (I am considering having my December Theme Unit be either "Oz-mas" and using Pete's Wizard of Oz and some of Alicia's activities or "Dickens Holiday" and using Pete's "A Christmas Carol). 4Pete's Sake has two modes. The first mode, called Padlock, locks the slide so that the student cannot turn the page until a second switch (or button on the keyboard) is pressed. 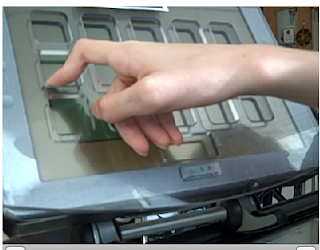 The second allows the students to move forward and backward withing a slideshow using one switch and a scanning box with arrows on screen. Padlock seems like a great way to allow students to turn the pages of a story or another kind of slide show for themselves or a group without worries of that "12 switch hits in 6 seconds and the book is over" situation. Back and Forth mode could be a great way to teach beginning scanners. You could even have yes/no on two slides to answers questions. Or a student could have two slides with Red Light/Green Light and run a fun game for friends. The possibilities are endless. The Loundon County Public School has an assortment of Tips and Tricks Videos in the AT section which are worth checking out. As always I want to give public kudos to great customer/technical support. This past Monday I spent some time speaking with Alec at Tobii ATI getting some support for a Mercury. Thanks, Alec. 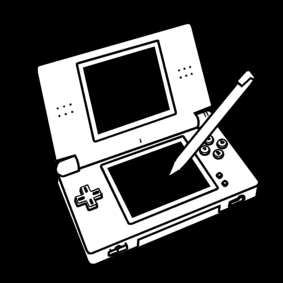 DS Talker is an older free program by the people who bring us the Sclera Symbol set that runs on a Nintendo DS. Tap to Talk is a newer program for the Nintendo DSi or DS Lite that retails for a subscription of $99.95 a year. Both program are dynamic display. As it is free you will need to do some work to get the DS Talker working. The program is in German, but the English manual explains in detail how to make it work in English. (Although a techie friend or gamer 17 year old is likely to make it work the fastest.) The program uses the free white on black Sclera Pictos. Tap To Talk include the software for the DSi or DSLite and a web based application to program boards as well as clipart symbols. Other symbol sets can be used if converted to .bmp format. You can play with the application before you buy it with an online emulator. Having played with DS Talker and watched the Tap to Talk videos the programs see to run in nearly identical ways. Attainment Company has another mid-tech AAC device, the Attainment Talker 24 or AT24. Running on 2 AA batteries the AT24 can be held in one hand and activated with the thumb, laid on the table or mounted. Each activation area is 3/4 of an inch with (obviously) 24 buttons. The AT24 has only one level and retails at $69.00. 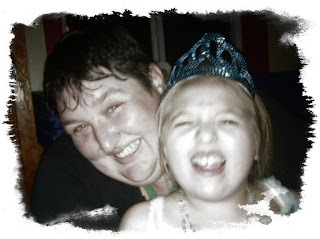 Alicia at SMD Teacher has begun her own Video of the Day Blog, as a response to my Kate's Class Video of the Day Blog. I have to say Alicia's blog is fantastic, she involves her students in choosing the video and then posts the favorites, whereas I choose a video the night before to play at the end of Morning Meeting as a transition cue as we move into morning ADLs. Also Alicia does not use video's from YouTube, which will be a great gift to many of you with over zealous security blockers in school. Mayer-Johnson has two new ways to bring the power of Boardmaker Plus. The Boardmaker Plus Player Subscription allows teachers and therapists (and families) to access the Boardmaker Plus content by through an online membership. Costing $39.00 a year this is an alternative to the Boardmaker Player Disc at $125.00. You can install the subscription version of Boardmaker Plus Player on as many computers as you would like, but only one location can be logged in at a time (unless you buy multiple subscriptions). This seems like a great solution for school and communities that have great internet access, but for those of us in schools with limited internet access or communities where families may not have a fast internet connection (yes, people still use dial up), I think we are STILL holding out for Boardmaker Player on a Flashdrive. You know what else? It seems to me that if you buy a Boardmaker Plus Player disc it should come free with one online subscription. The next product is the Mobile Activity Player. This is a portable net book pre-installed with Boardmaker Plus Player either three or six of the Curriculum Companion series of activities. The net book has a touchscreen that rotates so it can be used as a laptop or tablet, and has a nifty handle. It is WiFi enabled (and can connect via wires) so you can download activies via AdaptedLearning.Com. The netbook has an Intel®Atom™ N270 1.6 GHz Processor, 1 GB RAM, and a 60 GB Hard Drive. For connections it has an Ethernet Port, USB Ports, Headphone Jack, Speakers, VGA port, and a 2-in-1 SD/MMC memory card reader. No word on how loud the speakers are (meaning if you could use the device as an AAC device in a loud place). Battery life is 5 hours. If you want to install anything else, such as pre-made board sets you already own you will need to either buy an external DVD or CD-ROM, put everything on a flashdrive to move it over or move things over via the internet. You will need to purchase a switch interface or use one you already have for your switch users - the netbook does not have switch ports. The Mobile Activity Player retails for $749.00 to $949.00 including Boardmaker Plus Player depending on how many Curriculum Companion activities you choose to have pre-installed. Given that many school can't afford paper, books or the endless supply of H1N1 preventing Purell right now (not to mention teachers/aide having pay freezes, 2% pay cuts and the state of Hawaii having nearly every Friday as a unpaid Furlough day) I don't know how a product just under a thousand dollars is going to sell, but perhaps some (rich) schools/districts/parents can afford a Mobile Activity Player or they will use the illusive "stimulus money" we all hear about and never see in our classrooms. By now many of use are familiar with the durability and usefulness of the mid-level AAC devices in the Go Talk family from Attainment Company. 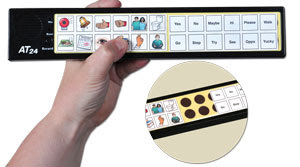 The Go Talk One and the Button offer a one message option, while the Go Talk 4+, 9+ and 20+ offer a relatively inexpensive five level static display device (with 4, 9 or 20 buttons plus a core vocabulary row). The Go Talk Pocket offers the same with six buttons in a hand held size. 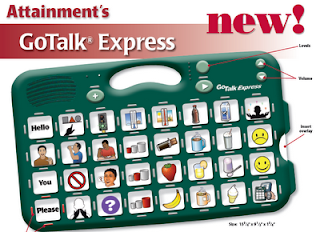 Coming soon (2/15/10) Attainment Company will be offering the Go Talk Express. It will feature everything we are used to the sturdy case and handle, the overlay storage, five levels, volume control, level lock, level delete and it is green. However it also features switch access and scanning (see below), over 26 minutes of recording, and an "express mode". The express mode is for sentence chaining (or it could be use to pre-train students for minspeak/Unity if you are crafty about it) allowing users to select a series of icons to make a sentence. Express mode does not have to be used, you can use it the same way you do any Go Talk. It will retail for $599.00. Here is the brochure. Eventually, if not from the first day of your special education career, you will come in contact with braces, splints and orthoses. You will be expected to apply and remove them, monitor skin integrity and teach others to do all of these things. I have worked with some great OTs and PTs over the years who have given me excellent information. Early in my career I also worked with OTs and PTs who gave me little or erroneous information. Here is some of the best information I have received. 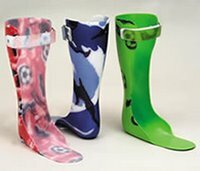 Leg braces or AFOs (Ankle Foot Orthoses) are worn by many students with cerebral palsy, muscular dystrophy and other low incidence motor disabilities. AFOs and most custom orthoses are ordered by a physician and made by an orthotist. The body part, in this case the lower leg, is casted and a model is made of it. Then the orthotist builds a brace out of a special plastic. AFOs are made only for the child the prescription was written for and are not intended for use by anyone else. AFOs and other prescription orthoses are designed to be worn over a thin layer of clothing without any wrinkles in the fabric. Care should be taken to put AFOs on the correct feet, marking the AFO may help speed up this process. When putting an AFO on a student the student should be seated or lying on his or her back. The sock should be pulled all the way up and be smooth. After placing the child's leg into the AFO make sure the heel is all the way back; you can do this by lifting the toes to and visually checking heel placement. Once the heel is back secure the velcro across the instep (if there is one) followed by the top strap and the toe strap (if there is one). Pull the sock down a bit by the toe to ensure their are no wrinkles. KAFOs are similarly put on, only the part that attaches to the thigh and the connected AFO should be put on at the same time. For both AFOs and KAFOs children generally wear sneakers one size larger than usual with the insole removed. There are also special AFO shoes available. A new kind of AFO has been developed out of England. It is called the SAFO for Silicon AFO. It is lightweight and flexible. Those who wear it claim it is much more comfortable and cuts down on fatigue. It is very expensive, about $3,000, and is not covered by American insurance companies. Thus I wouldn't expect to see one in a classroom near you soon, but good to know about none-the-less. Back braces also know as body jackets and TLSOs (Thoraco-Lumbar Sacral Orthosis) are worn to treat or prevent scoliosis (curvature of the spine), to immobilize after spinal surgery or to support week trunk muscles. 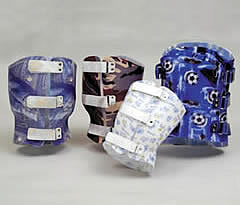 There are two primary types of body jackets you will see in the SpEd classroom. The first is the bivalve body jacket, which has a back and front and velcro down each side. The second is the overlap body jacket which generally opens in the front, with two or three strap of velcro across the front. You can find directions to apply a body jack by clicking on the type of body jacket above. My biggest tips are NOT to use the g-tube cut out as a guide for body jacket placement and to make sure the body jacket is on right side up, marking "top" and "bottom" inside the body jacket may help with this. Body jackets, like AFOs and KAFOs are meant to be worn over a thin layer of clothing, like a tight fitting undershirt. There are special "body socks" designed for wear under a body jacket, but insurance companies generally only pay for one or two a year. Hand splints are more variable than leg braces. Although some are doctor ordered and made by and orthotist, others may be made by your classroom OT, still others may be purchased pre-made. Some hand splints are designed for preventing contractures, others to aid in functional tasks and others to provide comfort and support. Skin care is of utmost important in the cast of any brace, splint or orthosis. When first worn the orthotist or therapist will generally recommend a 30 minutes on/30 minutes off schedule, checking the skin before and after for any redness. Gradually the time on will increase as tolerated. Redness lasting longer than twenty to thirty minutes usually means the brace must be adjusted. Many orthotists recommend rubbing the skin under the brace with alcohol several times a day to toughen the skin and discourage use of lotions which soften the skin. I have had student who love their braces, splints or orthoses and I have had students who have tried to hide, destroy or throw away their devices. One of my students will complain of her body jacket being uncomfortable, but will want it adjusted, not removed, because she likes wearing it. Another of my students glares at the person who puts his body jacket on and will even make gagging noises when he first has it on in order to get it taken off (telling him to knock it off works just as well as removing the body jacket). "So Don't And See What Happens!" 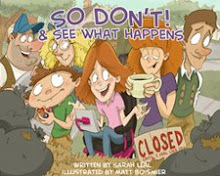 Today my class read the super fantastic book, "So Don't and See What Happens!" by Sarah Lead. This book is great for so many reasons. First of all it stars Madi, who communicates by Dynavox and travels by power wheelchair and her brother. What could be cooler than a book starring a character that uses a wheelchair and an AAC device? Which brings us to, third, the characters, theme and language are age appropriate for older students with multiple disabilities without being too complex (although differentiation is, as always, required). Next the illustrations are just charming. We think the picture of Mady's brother's teeth is gross! We also love Madi being fed by her brother, as if it happens everyday, because it does! Finally the topic, "so don't and see what happens", which is all about thinking about long term consequences, realizing your actions impact others and making choices that value health, safety, learning and relationships over fun and immediate gratification is very relevant to our students. Some students may be learning how to make simple financial decisions (if I spent two dollars on a soda now I cannot buy lunch later) or basic participation decisions (if I tantrum and refuse to work I will annoy both my teacher and my friends), but these all can be explored in the vein of, "so don't and see what happens". Our class will re-read this book next week (and probably quite a few times after that). Following next week's reading we will make a book that has three pages, "Things I Need to Do", "Things I Like to Do" and "What Might Happen if I Don't Do What I Need to Do!". It should be fun and we will be able to tailor it to each student's particular need to think about "seeing what happens!" "So Don't and See What Happens!" is sold by Cinnamon Freckles online and accepts PayPal. The cost is $15.00 CD. I hope you all know about the wonderful Boardmaker sharing resource Adapted Learning. Adapted Learning lets everyone who uses Boardmaker share what they make. In doing so we reduce the work load for everyone. Just this week I logged on and found a fantastic activity about dressing for the weather. Some of my students are struggling with the concept of hot vs. cold and this was just the thing. I downloaded it and made some changes for low vision and voila I had a lesson ready to go! 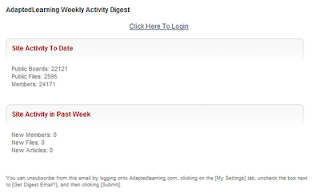 However I am a little worried when the "Site Activity in the Past Week" section of Adapted Learning's newsletter says "O" for New Messages, Files and Articles. I know we are all busy, but I also know we are all making new things all the time. It only takes a minute to upload something, so why not go ahead and do it? Even if you think you are too new to teacher/SLP/being a para/using Boardmaker, share with all of us. You might be surprised at home much value your activity has for all of us! Oliver Labels offers safety wristbands, waterproof inside shoe labels, large and small bag labels, iron on and stick-eez clothing labels and waterproof original and mini sized stick on labels. What is unique about Oliver Labels is they offer a "Found It" service where every user of their labels can purchase a tracking number and have their tracking website and their individual tracking number imprinted on the labels of their choosing. The labels have an option for allergy labels like food allergies, no nuts, not eggs, no dairy, no gluten and no seafood. The fashion inspired and monogram designed are appropriate for older individuals with special needs. Products are shipped out in 24-48 hours and prices range from $19.99 to $48.99 depending on what you purchase, the higher prices are for packages. If your school or agency needs to do some fundraising Oliver's offer that chance. Please remember it is not generally recommended for your child's name to be visible to strangers if they do not have the needed skills around staying safe. This is an ongoing entry -- please contribute using comments. This month's Unique Learning is about geography. The elementary level is focusing on city and country, the intermediate level on transportation in the USA, the middle school level is focusing on the five regions of the USA and the high school level is focusing on working in the USA. Here are some resources that may be helpful to using adapted the November Unique Learning for learners with significant, multiple disabilities. 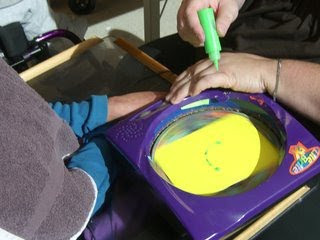 HelpKidzLearn has posted more free online activities for learners with special needs. They include Aunty Maggie's Recipe which allows you to pick ingredients and then drink your brew for a surprise, works with all access methods including switch(es), Paint Farm Animals which is self-explanatory and works with a mouse, mouse emulator or touch screen/interactive white board (and will be perfect for the elementary level of November's Unique Learning Curriculum), and finally Shape Pictures -Transport which ask learners to drag and drop shapes to make pictures of things like bikes.